The University of Louisville Athletic Center has an energy that just motivates you to want to perform. 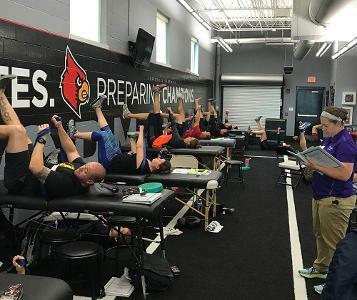 Home of the Cardinal's, the athletic staff including Teena Murray, Sean Smith, Chris Hays and the rest of the U of L athletics staff hosted Postural Respiration last weekend. Many thanks for the Louisville staff for hosting PRI. This was a group that was heavily weighted with strength and conditioning professionals not only from Louisville but from nearby training facilities as well. There were several DPT's and PT's that work in a hospital setting or private practice. Sarah Martin, DPT, PhD was lab assistant and was critical in making this weekend a success. One of the participants, Molly Binetti, works with Louisville Women's Volleyball and Superior T-4 Syndrome was a critical topic for her athletes as well as for Josh Kesel who is a strength coach for his pitching and performance practice for baseball pitchers. TOS, or thoracic outlet syndrome, was discussed regarding high performance athletes who compensate with scalenes and are prone to Superior T-4 Syndrome. One of the demonstrations of the manual Superior T-4 technique, to determine if Superior T-4 Syndrome exists, was performed for the group to see if a left apical chest wall deficit as opposed to the right existed. Left apical expansion was limited and a Right Subclavius Myosseous Restorative Technique to restore normal BC chamber function was provided with all PRI tests becoming neutral after this technique was provided. This individual in lab could have not been a better subject and it is always a welcomed outcome for the instructor! Even though this was a Postural Respiration course, PEC issues were discussed in detail for performance athletes and Mike Cantrell's article on Inferior T-8 syndrome is a must read for everyone. There are always PEC's who love extension for performance and one of the attendees benefited from a two person Infraclavicular Pump performed by Sarah Martin and me. 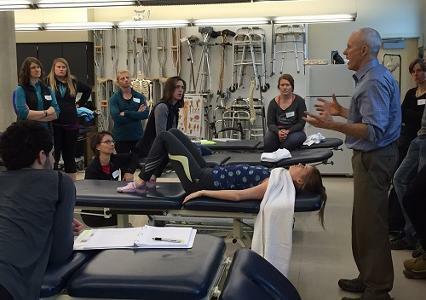 Sutter Physical Therapy sponsored their first PRI course this past weekend with 31 out of 40 students being new to PRI! Roseville is located near the base of the foothills of the Sierra Nevada of California not far from where gold was discovered in 1848. This location site was a real "nugget" when it comes to students eager to learn Postural Respiration. Suzie Maciel, PT is continuing education coordinator for this facility and this was her first course as well. She and her staff provided a great location and her support was so valuable. Thank you Suzie. In addition, she and Dan Houglum went to PT school together! Taylor Lewis, PRT and PRI faculty member Dan Houglum, who came out from Wilmette, IL, were lab assistants for the weekend. This course had "ton's" of lab with time to get into manual and non-manual techniques thanks to these lab assistants. Both were complemented on evaluation forms for their knowledge and skill with applying PRI principles. The real show, other than the Diaphragm, or "Big D", were the students that attended. Taylor, Dan and I were more than impressed (astounded really) with the insightful restates and questions from this group of students who were always "spot on" with their questions in this course. Questions pertaining to what is the relationship with the Diaphragm and walking, how this work applies to COPD and Cystic Fibrosis, and some of the personal experiences of students learning techniques and how their bodies responded were impressive! 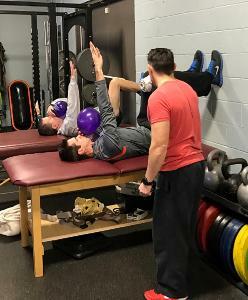 One student, an ATC who works with a major league baseball team, took his spring vacation to attend Postural Respiration and is enthusiastic about implementing PRI with the players he works with. In addition, topics of system integration, sympathetic vs. parasympathetic as it applies to extended individuals and lateralization as it applies to the concept of neutrality and transition zones were explored during this weekend of PRI discovery! Dr. Skip George talks about how breathing compensation (Superior T-4). He also talks about how to "unlock" the right side of the ribcage to allow airflow. He also talks about how activating a hamstring and ab wall can help along with a Gonstead adjustment. "The brain is driving the whole show"
Learn more about Postural Respiration here. Dr. Skip George talks about how breathing dysfunction can affect ribcage, pelvis, cervical and thoracic spine movement. Scalene influence on rib rotation and how the ribs can influence the spine according to Fryette's Law are also discussed. "Breathing is probably the most common movement dysfunction that human beings develop." 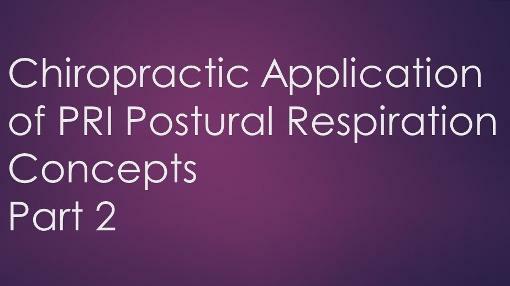 Learn more about the course Postural Respiration here. This Postural Respiration class was about 80% first time attendees to a PRI course. What was impressive was how good and how many questions were asked during the weekend. The questions were always relevant and "on point" helping to guide other students in their understanding of what can be an overwhelming experience for a first timer! 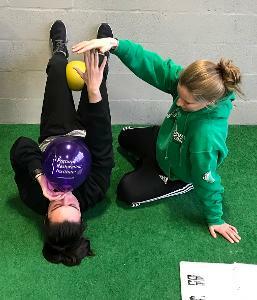 This is when teaching a course is at its best when students are helping other students in understanding rib kinematics and the necessity of diaphragm shape and position as it relates to their rehab protocols and sport performance application. Erin Rajca did an incredible job as my lab assistant! Some of the questions included how does the shape of the left or right diaphragm reciprocate and alternate during dynamic activities like walking in different phases of gait? This is a first time hosting of a PRI course at this facility and the feedback on Sunday is that they want more! Thanks for hosting Apex Physical Therapy! The first Postural Respiration course of the year was presented at Rehab2Perform in Frederick Maryland. This facility is a perfect blend of rehab and performance as stated in it's name! 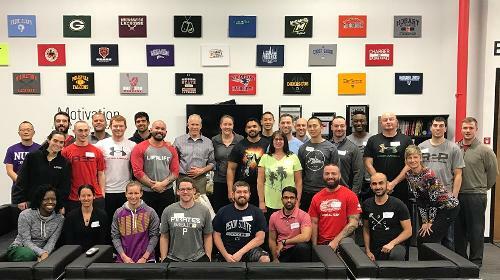 Physical therapy, functional training, group coaching provides the backdrop to the diverse group of attendees including PT's, CSCS's and even an M.D. Some of the topics that attendees, and usually all attendees have, is the difference and purpose of a right arm reach vs. a left arm reach. This issue can be vexing for even veterans of several courses. One way to remember this is a right arm reach first turns a diaphragm to the left taking a pelvis with it. Get and hold onto a left hamstring and left abdominal wall then with the help of left serratus and left low trap, a left arm reach then turns a ribcage above T-8 to the right. Caution with superior T-4's was a theme reinforced over the weekend and veterans that had some questions about the reasoning regarding which arm and when to reach with it came away more relaxed and settled with this issue. Strength and conditioning professionals got whatever you load you will reinforce so get neutral, stay neutral and then load, move and perform! All in all a great facility, hosts and especially curious students! Thanks to all that attended and Josh Funk, DPT, CSCS, PRC for providing this facility! The first thing any skier learns is how to stop! The next is how to control speed coming down a hill and then turning skis to provide direction in what at first feels like a very awkward, sometimes out of control and for most ultimately exhilarating experience! Positioning the skis in what is called a “snow plow” is what most beginners learn and both inside edges of the ski (medial under the arch of the foot) are used to slow, stop and turn the skis. Essentially the feet need to evert to create resistance on the snow with the tips of the skis close to each other but not crossing and the tails of the skis wide apart. This looks a little like a slice of pizza to most youngsters (and oldsters!) and we say “get into your pizza wedge”. In this snow plow position, if a skier leans over to the right side, they will turn left and visa versa. Learning how to parallel turn means both skis turn together everting and inverting at the ski boot. Since the boot doesn’t allow for frontal plane movement of the ankle joint, frontal plane to evert and invert a ski will need to come from the hips and knees. The feet and ankles sense frontal plane and actually determine direction of the ski. (Well the brain actually runs the whole show but needs feedback from the periphery!) 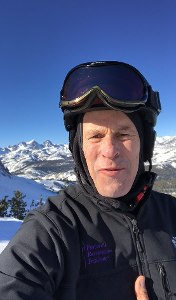 In fact, part of skiing well is termed “skiing in your boots” or having a good proprioceptive sense as to what your feet are doing, sensing and directing while sking. Sagittal, frontal and transverse plane awareness, repositioning and training can enhance not only skiing technique and enjoyment but performance as well. It doesn’t take much of a decline on a ski hill for a person to go faster than they are used to when walking or running. The ability to manage and be controlled without falling even at high speeds is always a goal with skiing. There is no shame in falling and even the best fall but the potential for injury increases without awareness and control of all three planes. There are many ways to fall but one of the biggest culprits is leaning back or extending. However, especially with many recreational skiers, if they come upon a steeper hill than they are used to, the tendency is to lean back out of fear of falling or inability to control speed on a steeper hill. Training a person to push forward into their boots, bend their knees and reach forward with their arms helps to keep the center of gravity over their boots. The standing wall reach is a prime example of a repositioning technique that trains a person to flex at the knees and the thorax, internally rotating ribs with exhalation and retracting a ribcage with inhalation. Reaching forward is exactly what needs to occur in skiing to stay centered over your skis so you can anticipate changes in terrain and speed. Another way to fall is while skiing on a steeper hill, instead of staying over the “down hill ski” with your weight, you lean into the hill, loose edge control and start to slide and fall. Remember this can happen on a right turn more easily than a left because you need left inside edge control ( Left stance phase) that only comes from having a femur that can adduct and internally rotate. You also need weight driven over into your left hemisphere or thorax so you can set that edge into the snow while your uphill leg (right leg) is inverting for outside edge contact and to some degree control. The left leg needs to be in Left AFIR with FAIR to “crank that turn” and the right leg needs to be in Right AFER and FAER in a synchronized fashion. Another way to fall is turning from the left to the right. If an individual has the inability to have a neutral left oriented pelvis, go into left AFIR, drop a left shoulder over their ski with abdominal control and achieve a ZOA so they can reach forward with a left hand and right counter trunk rotation, then the transition from a left to right turn can be an issue. Oh and don’t forget, their posterior mediastinum still needs inhibition while the lower trap on the left needs to help with left frontal plane control of a left hemisphere! Whew! So, they are stuck in an extension moment as they attempt to get onto their left leg to turn right and as they do so they lean back and have a tendency for an extension rotation fall. There are about as many ways to fall as there are types of snow and skiing conditions! These three are not an exclusive list for sure. In PRI we all know that sagittal plane control and maintaining position is key to our rehab and performance goals. Without a neutral pelvis we are inhibited in achieving adduction of a femur especially on the left with Left AFIR and the ability to turn right as well. Without a neutral pelvis, a ZOA is not possible especially on the left. Without a ZOA you soon run into the painful limitations of end range loading and excessive torque in the spine, hips and knees. 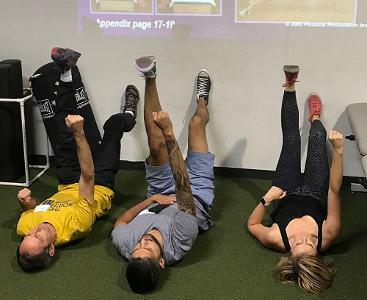 Performance skiing for recreational skiers who just want to have some fun to the more serious competitor or expert skier could combine PRI principles through a strong foundation of a pelvic floor for starters. A strong pelvic floor and a neutral pelvis drive the femurs and knees forward into the feet and ski boots to flatten that arch shaped ski for edge control and the ability to turn at will. A neutral pelvis with equal AFIR/FAIR of a provides right turns as well as left turn ability and strength. Being able to counter rotate a ribcage over a right or left oriented pelvis allows for efficient transfer of weight right to left side for edge control and quick turn transitioning. Reaching forward down the hill engages the abdominal wall, serratus anteriors, lower traps all in a harmony to provide a neutral thoracic curve with a retracted ribcage maintaining center of gravity with bent knees right on top of your feet a driving forward through the shins into the ski boots. It is my humble opinion that PRI principles can help any skier of any ability, especially turning right as well as turning left! See you all on the slopes. We have a great winter just starting!